Most orders ship within two business days (Monday through Friday only) from approval and payment of your proof. For specific delivery dates, please note it in the Further Comments section of the order form. We'll do our best to meet your deadline and contact you for details on upgrading shipping. Our standard shipping is free for the lower 48 United States, on most items*. Depending on the weight of the item, standard shipping is either US Mail or UPS Ground. You may also upgrade through UPS. We offer Ground, 3rd Day, 2nd Day, and Next Day Air. We ship from the 46040 ZIP code. 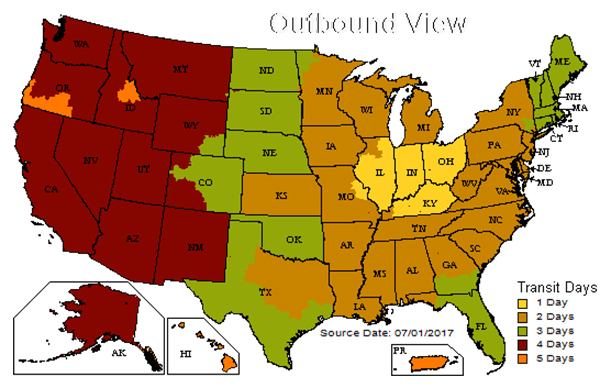 How long does standard shipping take to arrive? We cannot guarantee delivery times with US Mail, but most orders arrive within 2-5 business days. We ask that you allow 10 business days before contacting customer service. Barring extreme weather conditions, UPS shipping is guaranteed by ship date. Yes, but additional fees apply. Please email or chat with us about shipping quotes and options. APO shipping is free. but only priority shipping is available. **We are not able to accept returns on headstones that your cemetery rejects, please be sure to check with your cemetery before purchasing a headstone through us. Customer is responsible for shipping fees associated with the returned items.